Naim Uniti Star review | What Hi-Fi? The combination of myriad source options and great sound make the Star an obvious choice. It’s fair to say Naim’s new generation of Uniti products has been something of a smash hit. We’ve already reviewed the Atom streaming system (£1999) and the higher-end Nova (£4199) from the range, and loved them both. Now it’s the turn of the Star to impress us. The Star is a cutting-edge streaming system - all you need to do is to add speakers. It differs from its pure streaming siblings in having a CD drive built-in. This makes it ideal for anyone who still has a CD collection but also wants the ability to streaming music in any manner they choose. The Star's streaming options are numerous. Highlights include aptX HD Bluetooth, AirPlay (with AirPlay 2 coming soon) and UPnP (network streaming), as well as embedded support for Spotify, Tidal and Chromecast. It’s also Roon-ready, and capable of working as part of a Naim multi-room set-up along with the company’s other streamers and wireless speakers. As for physical connections, there’s a generous spread of analogue and digital inputs to accommodate external sources, including HDMI ARC to make connecting the Star to your TV easy. You will be able to have a DAB/FM module fitted too (as a £150 cost option), but this won’t be available until early next year. Overall the Uniti Star is a well-equipped unit, and we think Naim has covered every reasonable request. The company hasn’t scrimped on the engineering either. The internal amplifier is based on the Class A/B circuitry used in the highly regarded Nait 5si stereo integrated and outputs a healthy 70W per channel. That’s enough to drive most price-compatible speakers to decent levels. We certainly didn’t have any issue with our (rather inefficient) reference ATC SCM 50s or with more obvious partners like Spendor’s A7 or Neat’s Iota Alpha. In use the Uniti feels classy, as befits its premium price, and is clearly built to last. 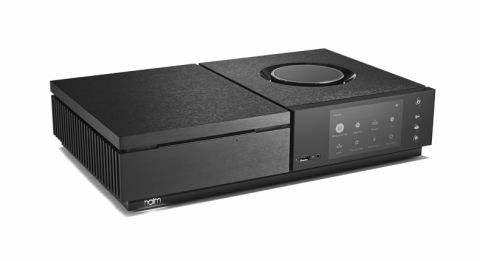 Naim has a great track record for supporting its products for years, and we don’t see why things would be any different with this one. The Star is easy to use, as a product of this type and price should be. At the front you’ll find a 5in full colour LCD display - it's crisp and easy to see from a distance. The screen also has a proximity sensor that will make it wake up even before a button is pressed. Next to the display are a few control buttons covering the basic functions. There’s also a well-designed handset that works intuitively. Of course most of the time we use the Naim’s dedicated app, which - while not what we'd describe as perfect - is currently one of the better efforts around and continues to improve with regular updates. We start with the Star’s CD section. It’s possible to use this as a ripper too, though you will need to attach a USB storage device. As a CD player it sounds detailed and focused. We play Stravinsky’s The Rite of Spring and the Naim copes with this demanding piece well. The unit sounds organised and stable throughout, coping with the music’s savage dynamic sweeps and complexity with control and composure. Tonally, the Uniti sounds pretty even and has plenty in the way of solidity underpinned by firm, grippy bass. The story is even more positive when we switch to UPnP streaming from our usual Naim network server. The Star now sounds even livelier, while retaining the insight, composure and punch we admired in the CD playback. Playing a raft of music, from Bruce Springsteen’s Radio Nowhere and Jay Z’s The Black Album right the way through to Beethoven’s Midnight Sonata, the Naim sounds right at home. It doesn’t favour any particular musical genre and just gets on with the job of entertaining. There’s plenty in the way of musical cohesion and rhythmic precision to keep things interesting. Switching to Tidal doesn’t dull our enthusiasm. The Star’s appealing musical character doesn’t change, and we’re pleased with the unit’s responsive nature. The unit moves between sources seamlessly, a feeling reinforced by the quick pairing with our iPhone 6S for Bluetooth use. We try out the headphone output and are pleased to report it’s a good one. There are quite a few products on the market where sound through the headphone socket is a poor relation to that heard from the speaker outputs. That’s not the case here. It’s clear that Naim’s engineers have taken care to ensure the level of dynamic subtlety, resolution and musical drive remains consistent between outputs. We’re not the least bit surprised that the Star turns out to be so capable. Our experience of other Uniti products gave us a pretty good idea of Naim’s talent in this arena. The Star is a great addition to the range, and if you need CD replay is the obvious choice.